I know I often say how much I love this meal, or that meal, or these cookies, etc. The thing is, I don't blog something we didn't like! If I cook something and it comes out poorly you'll never see it here. Therefore it's hard for me to not be excited about the food I share with you! With that said- I can't say enough about this casserole. The word "casserole" stirs up bad images, right? You think mushy veggies, overcooked grains, and gloppy sauce. I challenge you then to reverse your image of the casserole and try this. TRY THIS. Please do. It quickly became one of my all time favorite meals. I can't wait to make this again (and again and again). The sauce is so delicious and the texture of the rice when it cooks in the sauce... perfect. It really was just so good. So please, whatever you're doing, stop and add this to your next dinner menu. It's just that good. 2- Melt the butter in a large skillet. Add the mushrooms and cook for about 5 minutes, until softened. Add the flour and stir well to coat. 3- Stir in the marsala wine and cream, allowing to cook and thicken, about 3 minutes. Stir in the broth, parsley, and season with salt and pepper. 4- In a 9x 13 dish, spread the rice in an even layer over the bottom of the dish. Top with the chicken. 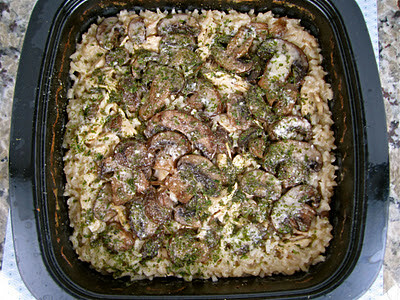 5- Pour the mushroom gravy over the chicken and rice mix. Cover tightly with foil. 6- Bake 35 minutes, until bubbling. 7- Remove foil, sprinkle on parmesan cheese, and bake 5 minutes uncovered. Yum, yum, yum!! I love casseroles for easy weeknight meals and this one sounds delicious. My husband loves chicken marsala so I know this will be a huge hit. What a great recipe! 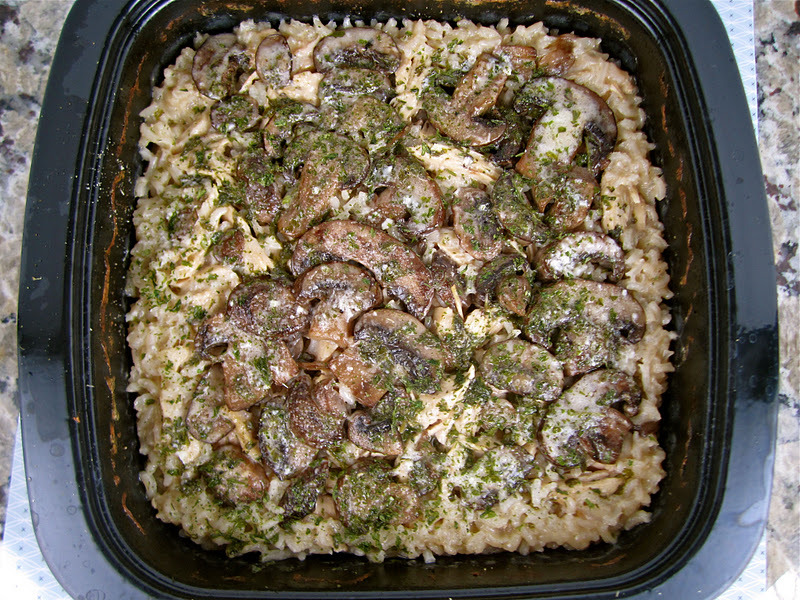 We love chicken marsala AND the convenience of a casserole. This sounds delicious! 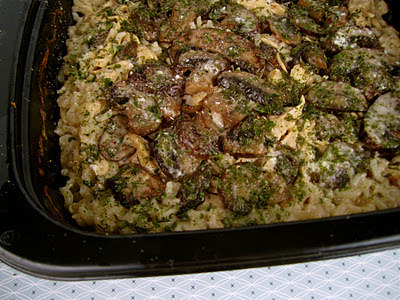 I love chicken marsala so I can't wait to try it! I made this tonight, my husband and i loved it. He told me to put this on the delicious list. Just made this for dinner tonight and am eating it as I type this. This. Is. Awesome. I found that it needs more salt than I anticipated. It also seems like it needs another flavor, but not sure what...maybe garlic? But even with no changes its amazing. Thanks for sharing. Made it tonight with half-and-half and some extra parmesan. Good -- will probably make it again. Agree that maybe it could use another flavor? But is fine without it too. Has anyone tried using brown rice? This recipe serves how many? I'd say about 4... 3 if you have big eaters, 4-5 if you eat smaller portions. I made this last night missing one major step - as I was about to put it in the oven, I realized I was out of foil! The rice was completely undercooked, despite cooking it an extra 20 minutes. I flavors were really good; I think next time I'll skip the oven and serve the sauce over egg noodles. I also added a clove of garlic after the mushrooms finished sauteeing, and next time I'll add a little lemon juice to the sauce before serving. Really tasty!